Produced by Francis Cosne and Alexandre Mnouchkine; directed by Jean Cocteau; screenplay by Jean Cocteau, based on his play; cinematography by Michel Kelber; art direction by Christian Bérard; production design by Guy de Gastyne; edited by Jacqueline Sadoul; music by Georges Auric; starring Jean Marais, Josette Day, Yvonne de Bray, Marcel André, and Gabrielle Borziat. Blu-ray and DVD, B&W, 105 min., 1948. A Cohen Media Group release. By all accounts, Jean Cocteau had a complicated family life, and this matters, because as the performing-arts polymath Simon Callow has observed, his work amounts to an extended exercise in autobiography. When the future genius was nine his father committed suicide—the reason remains unclear, but “he would not have had to shoot himself for the same thing nowadays,” Cocteau later said—and young Jean responded by drawing closer than ever to his mother, from whose constant ministrations he subsequently fled at age fifteen. He returned to her after sowing many a wild oat with partners of both genders, settling in with her for many years while cultivating his love for theater, music, and poetry. Forever after, what Callow calls “the great Oedipal themes—the absent father, perhaps destroyed by the son—and the overwhelming relationship with the mother” worked their way into every aspect of his literary, theatrical, and cinematic activity. They strongly inflected his personal life as well, including his bonds with a series of male protégés, among whom none was more gifted than Jean Marais, the splendid young actor for whose particular talents Cocteau created Les Parents terribles, produced as a play in 1938 and adapted to the screen ten years later. Josette Day as Madeleine and Jean Marais as Michel. Photo courtesy of Photofest. One usually thinks of Cocteau the filmmaker as the brilliant fabulist who vaulted into the avant-garde with The Blood of a Poet in 1930, dreamed up one of the great cinematic fairy tales with Beauty and the Beast in 1946, penetrated Death’s domain with Orpheus in 1950, and crafted his own celestial epitaph with Testament of Orpheus in 1960. But feet-on-the-ground family drama also figures in his filmography, most notably in the 1950 masterpiece Les Enfants terribles, directed from Cocteau’s screenplay (based on his 1929 novel) by Jean-Pierre Melville, the finest possible collaborator for that project. Les Parents terribles, now available in a well-produced new edition from the Cohen Media Group, is a less imposing production than its similarly titled successor, but it has enough merit to reward attentive viewing. Gabrielle Dorziat as Aunt Leo, Josette Day as Madeleine, Marcel André as Georges, and Jean Marais as Michel. Photo courtesy of Photofest. True to her possessive, passive-aggressive nature, Yvonne verges on hysterics when Michel announces his marriage plan, but the household’s other dominant woman, Yvonne’s unmarried sister Léo (Gabrielle Dorziat), makes the reasonable point that a twenty-two-year-old man has every right to make his own designs for living and loving, especially when his significant other is a responsible sort with a steady profession—she’s a bookbinder—and an income adequate enough to support herself and a lackadaisical spouse. Two additional factors complicate the situation, though. Before entering marriage Madeleine must break up with the “sugar daddy” she’s already involved with, and said sugar daddy is now revealed as Georges, the prospective husband’s father. On top of this, Léo has been in love with Georges as long as she can remember, keeping this a secret to spare her sister’s feelings and maintain the stability of the family unit. Might the discovery of Georges’s affair with Madeleine open a rift with Yvonne and allow Léo to swoop in and claim him, realizing her romantic dream at last? Such are the emotional dynamics that allow Les Parents terribles to start as sitcom, veer into melodrama, and finish as tragedy. The story’s most conspicuous theme is the age-old conflict between order, represented by Léo’s ongoing efforts to keep the household on an even keel, and disorder, embodied by the family’s penchant for physical and psychological messiness. Georges is a comic-book fan and inventor of useless devices—in the surrealistic opening shot, he’s testing an underwater gun with a scuba mask clamped on his face—and only Léo and Madeleine show consistent signs of everyday stability. Cocteau’s aim in writing Les Parents terribles was to reclaim a measure of conventionality in his own artistry, rejecting the eccentricity of his previous works for the popular routines of tradition-based boulevard theater. “This time,” he declared in a program note, “I’m transporting you neither by Greek chariot, nor by aeroplane on the shoulders of Merlin nor in a little racing car,” instead focusing on the eccentricities of a family whose “uncomfortable and ruinous” temperament generates surprising and suspenseful situations. Jean Marais as Michel and Yvonne de Bray as Yvonne-Sophie. Photo courtesy of Photofest. Like the play, the movie is a pièce bien faite, planting well-placed cues at the beginning—references to Yvonne’s insulin injections, a physician’s office upstairs, and so on—that will duly pay off at the end. One of Cocteau’s boldest moves is to resist opening up the scenario, restricting the action to the same handful of locations used by the theatrical version. The film is marvelously cinematic nevertheless, with occasional camera angles worthy of Orson Welles and plentiful close-ups emphasizing nuances of gesture and expression that would have eluded notice on the stage. In a filmed interview included as an extra in the Cohen edition, assistant director Claude Pinoteau, later to become a director in his own right, recalls Cocteau’s instruction to make the family apartment a well-rounded character by giving it distinctive tics and peculiarities—hence details such as a creaky closet door that won’t stay closed and a table leaf that clatters noisily out of place whenever anyone leans on it. The most intriguing cinematic touch comes in the finale, when the camera tracks back and away through an impeccably staged tableau of grief and resignation. Since the camera tracks would be visible in the shot, Pinoteau reports, Cocteau opted for a trackless dolly that was adjusted to the necessary height by having slightly deflated wheels, thereby giving the image an inadvertent rocking motion. When crew members saw the finale in the final cut, they found that Cocteau had added a few lines of voice-over stating that the “gypsy caravan” was now moving on to its next stage of existence. This small but crucial addition reverted to a “gypsy” motif in the original play and served at least three purposes: alluding once more to the family’s unmoored psychological state; justifying the slight unsteadiness in the camera movement; and diverting audience attention so the unsteadiness wouldn’t be too obvious in itself. Even in a project as theatrical as this, Cocteau the filmmaker was a filmmaker to his bones. 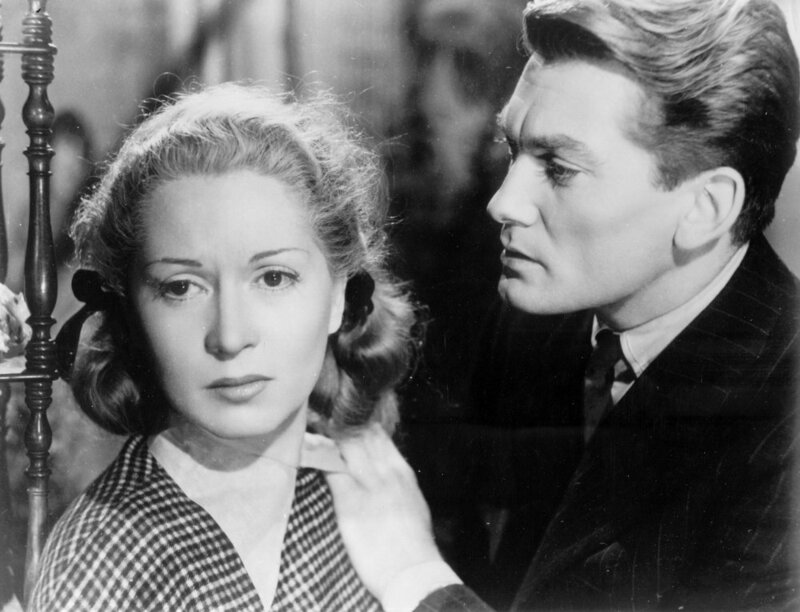 Gabrielle Dorziat as Aunt Leo and Jean Marais as Michel. Photo courtesy of Photofest. Cocteau’s decision to populate the film with the same cast as the theatrical production was a mixed blessing. On one hand, long experience with the script gave the performers a genuinely deep engagement with the inner and outer dimensions of their characters, as film scholar Richard Peña points out in a short introduction on the Cohen disc. On the other hand, Marais was no longer the very young charmer he’d been when the stage production premiered, and one suspects he was a tad more sparkling when he took his original shot at the role. Back on the plus side, it’s charming to see him and Day play such earthbound figures after their magical turns in Beauty and the Beast just two years before, and Day is especially vivid as Madeleine, throwing her voice into an almost strangled register when feelings threaten to become overwhelming. The other players are exactly right for their generically middle-aged roles. It’s good that English-language moviegoers have come to know Les Parents terribles by its French title rather than its alternate American title, The Storm Within, which has a Hollywood touch that’s all too syrupy. Michel Kelber’s black-and-white cinematography retains its richness in the Cohen edition, and the extras package is slender but respectable, apart from appallingly bad subtitling in the Pinoteau interview. Although few will mistake Les Parents terribles for one of Cocteau’s major achievements, it’s a domestic tragicomedy well worth viewing. David Sterritt is author of numerous books on film, most recently Simply Hitchcock and Roll ’n’ Roll Movies.